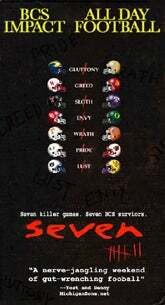 As has been established, tomorrow is a day for much gluttony/sloth/greed/skinny ladies' head in the box: seven pretty outstanding college football games. And no, we're not referring to Syracuse-Illinois. We are actually offended that the game is on television. Of course, the biggest game is probably Notre Dame vs. Michigan, if just because it's Notre Dame vs. Michigan. And we'd like to thank The House Rock Built for illustrated one of the things we absolutely love about college football: The unabashed homerness of the local announcers. This bothers us, a little, when professional teams do it, if just because it seems more steeped in who is writing the paycheck that the tribal loyalties college football inspires. If you're a college football announcer in, say, Athens, the Georgia Bulldogs pretty much are your life; your entire social structure revolves around the team (unless you're into REM). Victories enrich more, and losses devastate deeper. Therefore, we love The House Rock Built's comparison of the Michigan and Notre Dame announcers' reactions to the game-winning field goal at the end of the 1980 Notre Dame-Michigan game. You win, and your body is nothing but endorphins; if you lose ... where's the shotgun, Nellie, we're ending this right now. College football rules.